Your Body | Welcome to Peak Performance! Your body has innate intelligence. It knows how to grow, how to repair itself, and how to adapt to new surroundings, all without conscious thought on your part.Your body and brain together are far more powerful than even a very sophisticated machine or computer. Your body is a superb vehicle for enjoying your life. Your limbs and joints allow you to apply leverage, thrust or rotation to objects, letting you lift weights or throw a ball, jump in the air, or ride a bicycle. You can swivel or tilt your head to look someone in the eye or hear better what they’re saying. Your brain is like a supercomputer controlling your body, reacting to all sorts of signals and stimuli it receives from your senses through your central nervous system and telling your body how to respond. However, your body and brain together can do things that no machine or computer can do without human help. Everyday, without you having to think about it, your brain and body together handle all sorts of minor maintenance, scanning for weakness or damage and directing resources to problem areas to repair them. As you grow from your first days in your mother’s womb, through youth and maturity, your body and brain together adapt to ever changing conditions. Your brain knows how to direct your body’s growth without any conscious thought on your part. Even before your brain develops, from the very first moments of conception, as your first two cells become four and then eight and then sixteen, life knows how to become you. This is what we mean by innate intelligence. 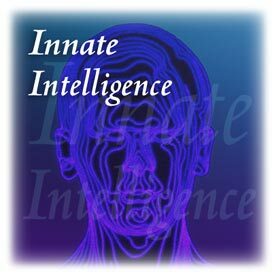 This innate intelligence of your body continues to be with you throughout your life. It is charged with keeping you alive. You share this innate intelligence with all living beings. It is, in fact, the very essence of all life. Each of us has an amazing depth of wisdom, carried in every cell, that holds our own blueprint for life and directs our individual development. This innate intelligence and blueprint allow our bodies and brains to work together to achieve our own particular peak performance, to reach our own individual potential, and to enjoy our lives to the fullest.